Over the past year, Calix, a network equipment provider specializing in fiber access solutions, made a concerted effort to expand its professional services organization. Acting on customer demand, the vendor, which primarily operates within North America, began investing in services including network planning, product installation, testing, and network turn-up. While Calix had a modest professional services organization prior to its ramp up, the expansion has significantly increased the role of services, both internally and externally. By the end of 2016, Calix hired a new services lead and fully committed to services expansion, adding expertise and capabilities. Calix derives a majority of its revenue from a small handful of key clients in North America in Windstream, CenturyLink and Frontier; its professional services expansion has made its relationships with these clients stronger by introducing an additional element of support. The vendor is undoubtedly more versatile, with a handful of services at its disposal, including the services outlined above as well as consulting, support, and technical services. During Q1 2017, Calix saw $25.9 million in revenue from services, up from $6.7 million during the same period a year prior. 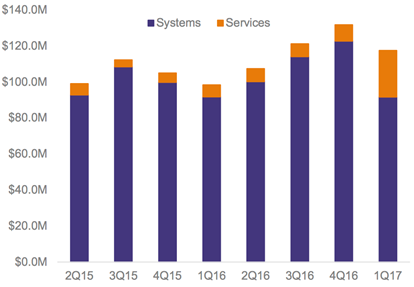 Perhaps more importantly, revenue from services accounted for 22% of the vendor’s revenue during the first quarter, up from 7% during Q1 2016. While revenue from services has grown significantly since Calix began its expansion, and specifically during Q1 2017, so too has the cost of revenue associated with services. In fact, the cost of services revenue has grown at a higher rate than revenue since early 2016, from $5.2 million to $25.8 million. Herein lies the true challenge in services expansion. The increase in services revenue share has negatively affected the vendor’s gross margins, which fell from 46.2% during Q1 2016 to 29.3% during its most recent financial disclosure. A transition towards additional professional services business is not the only change Calix is undergoing. Calix adopted a restructuring plan in March aligning its investments towards software-defined access systems and software, while pivoting away from legacy equipment. With ambitions to expand its business into software-defined solutions, the vendor has taken on additional research and development costs, rising from $89.7 million in 2015 to $106.9 million in 2016. All of this is to say the road ahead for Calix, while necessary, is a challenging one. Its professional services expansion has driven impressive growth, but thus far, this growth has not contributed to the company’s bottom line. For Calix to thrive in the services business, it will need to prove what all services players must at some point: the ability to scale.